Reading will take center stage during the silver-anniversary summer of the Children’s After School Achievement (CASA) at Hope College. Approximately 95 area elementary-age students will participate in CASA’s six-week summer session, which will feature the theme “Un Festival de Libros [A Festival of Books): CASA Celebrates 25 Years of Reading,” beginning on Monday, June 18. The program has received $8,000 in grant support from The Community Foundation of the Holland/Zeeland Area. In addition to underwriting field trips and presentations, the award is helping provide books and supplies for the related classroom activity running during the six weeks. CASA, a community organization housed at Hope, provides academic and cultural enrichment for at-risk first- through fifth-grade students. The program, which runs year-round, is intended to improve the students’ academic performance by providing the tools they need to succeed in school. During the summer session, CASA runs five classes, each led by a certified teacher and assistant four mornings a week, providing a mixture of academic work as well as enrichment programs such as participation in service projects, attending presentations by the Hope Summer Repertory Theatre Children’s Performance Troupe and the Herrick District Library Reading Club. In conjunction with this year’s reading-focused theme, the students will not only have a chance to read books—and participate in related events like a reading scavenger hunt and a classroom reading challenge—but will get to make books of their own. Regional authors will visit and talk about their work and read to the children. The children will take field trips for on-site reading projects at locales including the DeGraaf Nature Center and Windmill Island Gardens, and will visit the Holland Area Arts council for a reading/art project. During the school year, the students meet after school twice per week in one-on-one sessions with volunteer tutors, most of whom are Hope students. The academic-year and summer programs serve Holland and West Ottawa students. 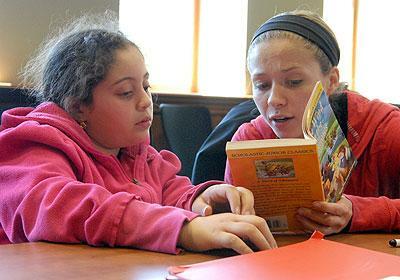 A total of 145 elementary-age students participated in CASA during the 2011-12 year. CASA was established in 1987 by Marge Rivera Bermann and Latin Americans United for Progress (LAUP) and originally housed at First United Methodist Church. CASA moved to Hope College in 1989, and has its offices and summer classes in Graves Hall and its school-year activities in classrooms in Lubbers Hall. Dr. Tim Pennings of the Hope College mathematics faculty has received one of two 2012 “Janet Andersen Lecture Awards” from the Midstates Consortium for Math and Science. For the tenth consecutive year, Hope this past season led all NCAA Division III men's basketball programs in home attendance.